While it may be difficult to awaken everyone from their state-induced fog of fear, we are at a critical point in history which requires us to try. We truly must take an objective look at the facts and evidence surrounding 9-11. While none of the many 9-11 researchers knows exactly what happened on that fateful day in September almost 3 years ago, any sensible person can easily spot dozens of inconsistencies in the official story that is being forced upon us. And these inconsistencies are huge. They range from the apparent stand-down of our immense military arsenal (for over an hour and a half) to the small hole and lack of debris at the Pentagon. There was Bush’s bizarre, uninterrupted photo op in a Florida elementary school, and then there is the matter of the remains of Flight 93 being scattered over eight miles of Pennsylvania farmland, a fact which suggests the plane may have been shot down. The official story seems wrong on all of these points. But the focus of this article is on just one point: the odd collapse of the three buildings in the World Trade Center complex. The World Trade Center (WTC) contained seven buildings. The Twin Towers were called buildings One (WTC1) and Two (WTC2). They collapsed in truly astounding fashion, but the event that caused me first to question the official story about the events of 9-11 was viewing videos of the collapse of World Trade Center Building 7 (WTC7). If you’ve forgotten, WTC7 was a 47-story building that was not hit by an airplane or by any significant debris from either WTC1 or WTC2. Buildings 3, 4, 5, and 6 were struck by massive amounts of debris from the collapsing Twin Towers, yet none collapsed, despite their thin-gauge steel supports. The 9-11 commemorative videos produced by PBS and CNN are best. Both clearly show WTC7’s implosion. Lower resolution Internet movies are also available. WTC7, which was situated on the next block over, was the farthest of the buildings from WTC1 and WTC2. WTC7 happened to contain the New York City Office of Emergency Management (OEM), a facility that was, according to testimony to the 9-11 Commission, one of the most sophisticated Emergency Command Centers on the planet. But shortly after 5:20 pm on Sept. 11, as the horrific day was coming to a close, WTC7 mysteriously imploded and fell to the ground in an astounding 6.5 seconds. 6.5 seconds. This is a mere 0.5 seconds more than freefall in a vacuum. To restate this, a rock dropped from the 47th floor would have taken at least 6 seconds to hit the ground. WTC7, in its entirety, fell to the earth in 6.5 seconds. Now, recall, we’re supposed to believe that each floor of the building “pancaked” on the one below. Each of the 47 floors supposedly pancaked and collapsed, individually. Yet WTC7 reached the ground in 0.5 seconds longer than freefall. Is this really possible? Judge for yourself. Watch WTC7 go down. It takes 6.5 seconds. Take out your stopwatch. What About Towers One and Two? Next, I turned my attention to steel beams that fell in freefall next to the building as it collapsed. The beams were falling at the same rate that the towers themselves were descending. Familiar with elementary physics, including principles of conservation of energy and momentum, this seemed quite impossible if the towers were indeed "pancaking,”which is the official theory. As I was considering this, another problem arose. There is a principle in physics called the Law of Conservation of Energy. There is also the Law of Conservation of Momentum. I’ll briefly explain how these principles work. Let’s assume there are two identical Honda Civics on the freeway. One is sitting in neutral at a standstill (0 mph). The other is coasting at 60 mph. The second Honda slams into the back of the first one. The first Honda will then instantaneously be going much faster than it was, and the second will instantaneously be going much slower than it was. This is how the principle works in the horizontal direction, and it works the same in the vertical direction, with the added constant force of gravity added to it. Jim Hoffman, a professional scientist published in several peer-reviewed scientific journals, took a long look at all of this. He calculated that even if the structure itself offered no resistance, that is to say, even if the 110 floors of each tower were hovering in mid-air, the “pancake” theory would still have taken a minimum of 15.5 seconds to reach the ground. So, even if the building essentially didn’t exist, if it provided no resistance at all to the collapse, just the floors hitting each other and causing each other to decelerate would’ve taken 15.5 seconds to reach the ground. But of course the buildings did exist. They had stood for over 30 years. The floors weren’t hovering in mid-air. So how did the building provide no resistance? Yet another observation one makes in watching the collapsing towers is the huge dust clouds and debris, including steel beams, that were thrown hundreds of feet out horizontally from the towers as they fell. If we are to believe the pancake theory, this amount of scattering debris, fine pulverized concrete dust, and sheetrock powder would clearly indicate massive resistance to the vertical collapse. So there is an impossible conflict. You either have a miraculous, historical, instantaneous, catastrophic failure that occurs within a fraction of a second of freefall and that kicks out little dust, or you have a solid, hefty building that remains virtually unaffected after a massive, speeding projectile hits it. You either have a house of cards or a house of bricks. The building either resists its collapse or it doesn’t. The official story maintains that fires weakened the buildings. Jet fuel supposedly burned so hot it began to melt the steel columns supporting the towers. But steel-framed skyscrapers have never collapsed from fire, since they’re built from steel that doesn’t melt below 2750 degrees Fahrenheit. No fuel, not even jet fuel, which is really just refined kerosene, will burn hotter than 1500 degrees Fahrenheit. Steel-framed skyscrapers have never collapsed from fire. It’s also odd that WTC7, which wasn’t hit by an airplane or by any significant debris, collapsed in strikingly similar fashion to the Twin Towers. 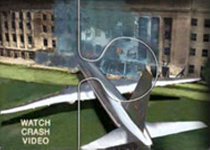 There wasn’t even any jet fuel or kerosene burning in WTC7. According to the 9-11 report by the Federal Emergency Management Agency (FEMA), "the specifics of the fires in WTC7 and how they caused the building to collapse remain unknown at this tim." Aside from its startling nonchalance, this statement makes a rather profound assumption. Again, no building prior to 9-11, in the 100-plus year history of steel frame buildings, had ever collapsed from fire. This fact was known to firemen. Hence their unflinching rush up into the skyscrapers to put out the fire. Partly it was bravery, to be sure, but partly it was concrete knowledge that skyscrapers do not collapse due to fire. Yet after 100 years, three collapsed in one day. So if the science in this article is correct (none of it goes beyond the tenth grade level), then we know that the floors of the three WTC buildings were not pancaking but were falling simultaneously. We also know that fire is an insufficient explanation for the initiation of the collapse of the buildings. Why, then, did the three WTC buildings fall? There is a method that has been able to consistently get skyscrapers to fall as fast as the three buildings of the World Trade Center fell on 9-11. In this method, each floor of a building is destroyed at just the moment the floor above is about to strike it. Thus, the floors fall simultaneously ? and in virtual freefall. This method, when precisely used, has indeed given near-freefall speed to demolitions of buildings all over the world in the past few decades. This method could have brought down WTC7 in 6.5 seconds. This method is called controlled demolition. A controlled demolition would have exploded debris horizontally at a rapid rate. A controlled demolition would also explain the fine, pulverized concrete powder, whereas pancaking floors would leave chunks of concrete. Controlled demolition would also explain the seismic evidence recorded nearby of two small earthquakes, each just before one of the Twin Towers collapsed. And finally, controlled demolition would explain why three steel skyscrapers, two of which were struck by planes and one of which wasn’t, all collapsed in essentially the same way. But having established that all three WTC towers had to have been assisted in their failures, I asked myself, Who could have planted the explosives to blow up the buildings in a controlled demolition? Could fundamentalist Muslim fanatics have gotten the plans for those buildings, engineered the demolition, and then gotten into them to plant the explosives? This seemed improbable. And after learning that WTC7 housed the FBI, CIA, and the OEM, it seemed impossible. Then I thought, Why would terrorists engineer a building to implode? Wouldn’t they want to cause even more damage to the surrounding buildings and possibly create more havoc and destruction from debris exploding away from the building? And if they’d planted explosives in the buildings, why would they have bothered hijacking and flying planes into them? Perhaps WTC7 was demolished to destroy evidence that would answer these questions. To this day, I don’t know. But this is how I began to question the official story about 9-11. Recently I learned that President Bush’s brother, Marvin Bush, is a part owner of the company that not only provided security for both United and American Airlines, but also for the World Trade Center complex itself. I also discovered that Larry Silverstein, who had bought the leasing rights for the WTC complex from the NY/NJ Port Authority in May of 2001 for $200 million, had received a $3.55 billion insurance settlement right after 9-11 – yet he was suing for an additional $3.55 billion by claiming the two hits on the towers constituted two separate terrorist attacks! He stood to make $7 billion dollars on a four month investment. Talk about motive. In conclusion, I’ll repeat myself. None of the many 9-11 researchers can definitively say exactly what happened on that fateful day in September almost 3 years ago. But any sensible person can easily spot dozens of inconsistencies in the official story that is being forced upon us. And the fact is, most of the available 9-11 evidence points to at least some level of government complicity or foreknowledge. Dave Heller, who has degrees in physics and architecture, is a builder and engaged citizen in Berkeley, California.